Crafting with recycled materials is good for the environment as well as your pocketbook. Make garden art, lighting for your home and landscape with recycled beer cans or other small aluminum cans. Creative crafters also make furniture and sculpture by stacking recycled beer cans in a variety of formations. Airplanes, cars, tractors and other transportation models are popular beer-can crafts. Recycle beer cans into garden art by making a set of wind chimes. Paint the outsides of 14 empty beer cans with spray or acrylic paint. After the background color dries, paint decorative designs onto each can with acrylic. Stencils and templates help simplify painting designs onto the cans. When the painted cans are dry, puncture holes in the center of both the top and the bottom of the cans with an awl. Make strands out of the cans by threading fishing line through the holes, knotting the line at the hole in the bottom of the can to secure it on the strand. Make four strands, one each with two, three, four and five beer cans. Add colorful beads, craft bells or any other small item onto the fishing line between, above and below the beer cans. Attach each strand to a round metal craft ring, from shortest to longest to create a spiral design. Transform recycled beer cans into decorative lanterns for your garden. Use a can opener to remove the tops from the cans. Cover the cut edge with duct tape for protection. 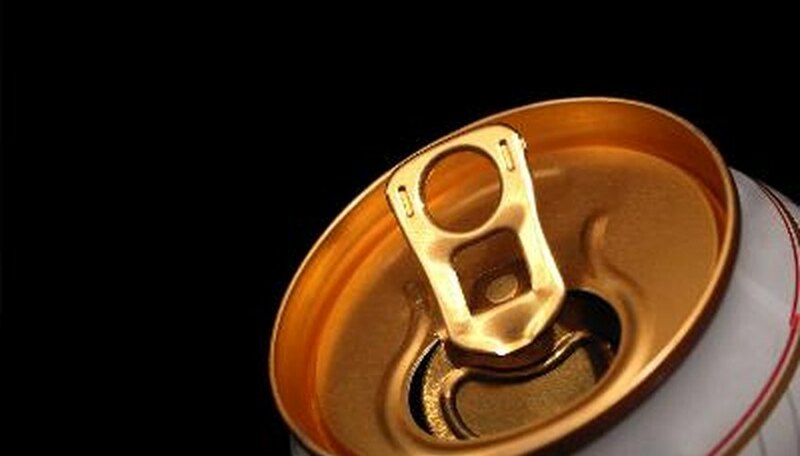 Fill the cleaned beer cans with water and freeze them. A solid surface inside the can makes it easier to punch holes in the thin aluminum without denting the beer cans. Puncture the frozen cans with an awl or a hammer and nails. Make a pattern with the holes or randomly place them all around the cans. Let the ice thaw and dry the cans completely. Paint the outside of the cans with spray paint, then decorate them as you like with acrylics. Embellish the cans by attaching colorful, flat-backed cabochons with waterproof construction adhesive. Place a tea light or a votive candle inside the recycled beer can. Turn two recycled beer cans into a model airplane. Cut the end from one of the cans and snip a propeller design with tin snips. Place the second can in a horizontal position and glue the propeller to one end with viscous craft glue. Make the wings by cutting shapes from the first can, and then gluing them onto the top center of the horizontal can. There are different versions of beer can model airplanes. Get creative and make your own design with recycled beer or soda cans.